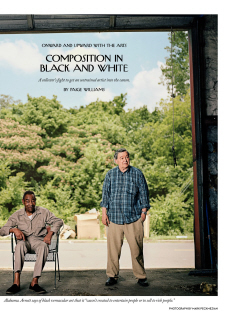 Just 10 days after I wrote a review of The Last Folk Hero by Andrew Dietz about Bill Arnett and Thornton Dial, the New Yorker has an article about the pair, "Composition in Black and White" by Paige Williams. Even though The Last Folk Hero was published seven years ago, this new article doesn't really add much. The primary events in Arnett's and Dial's lives since The Last Folk Hero have been health issues. But Dial is still producing artwork and Arnett is still out there making sure it gets seen. The article doesn't even have any good photos of Dial's art. But what it does do is place the story in front of vastly more eyeballs than the book did. After I wrote the review, Andrew Dietz wrote me. Despite the fact that The Last Folk Hero was very well-written and professionally packaged, it was in fact self-published with only modest success. Dietz explained that commercial publishers "didn’t want to take a chance on it." This seems crazy--it's a highly entertaining book. Anyway, you can get a hint of the story in the current issue of The New Yorker, but I recommend buying a copy of The Last Folk Hero--you can get copies quite cheap from Alibris.